Manchester United missed the chance to move 10 points clear of Liverpool after they became the latest victims of Everton's late-season revival. United could have increased the gap to their fifth-placed rivals in the race for Champions League places with a win. But James McCarthy's counter-attacking goal and John Stones' header had Everton 2-0 ahead at half-time. Kevin Mirallas beat the offside trap with 16 minutes left to clinch a fifth win in six league games for the hosts. It was the third consecutive season that the Goodison club have won this fixture, with last term's 2-0 victory proving the last game of David Moyes' tenure. Despite a worse reverse on Sunday, Van Gaal has no such fears but the Dutchman may well nurse concerns over the manner of this loss. All three Everton goals - while well executed - were entirely avoidable. McCarthy burst between Daley Blind and Paddy McNair who could only make timid challenges before converting coolly, Stones beat Antonio Valencia too easily in the air to fire in the second, and both Valencia and McNair switched off to allow Mirallas a free run at the exposed David De Gea for the third. Further angst could be found in United's apparent inability to capitalise on their possession. Denuded of Michael Carrick by a calf problem, Van Gaal's side were ponderous and became reliant on speculative efforts from distance by Marouane Fellaini and Blind. The coach withdrew Fellaini at the interval - the former Everton player having been booked for persistent fouling in spite of Van Gaal urging him to maintain his composure - and Juan Mata just after the hour, with Radamel Falcao and Angel Di Maria being brought on. The Colombian had his first attempt on target in 363 Premier League minutes with a looping header - and had a later effort correctly ruled out for offside - but the visitors' clearest opening remained a first-half Chris Smalling header that nestled in Tim Howard's arms. Further bad news came when the ineffective Wayne Rooney was withdrawn and was pictured applying ice to his left knee. 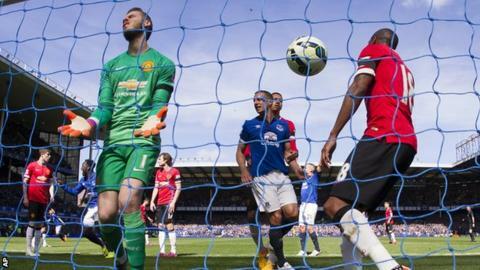 Everton, conversely, can be hugely satisfied with their biggest win over United in 23 years. Their fourth successive home victory without conceding moves them above West Ham into the top 10 and maintains an unbeaten home record in 2015. The defensive lapses that have scarred much of their campaign were replaced by combative and diligent displays and complimented by rapier quick countering attacks. The manner in which Ross Barkley, Seamus Coleman and McCarthy scampered forward for the fifth-minute opener was breathtaking and set the pattern for a splendid display. Stones' towering header exhibited their greater desire, while Mirallas' clincher was entirely in keeping with the ruthlessness of their performance; the Belgian running on to Barkley's long pass while United hesitated and finishing decisively. The defeat means United stay seven points ahead of Liverpool, who have played one game fewer. Everton manager Roberto Martinez: "We were in control and very comfortable in what we wanted to do. Probably 3-0 is a well-deserved scoreline. "It is a big demand to be in Europe and more than anything it is being able to cope with the mental fatigue. "I think we've learned huge lessons and maturity over the campaign but I don't think the players have had the credit they deserve." Match ends, Everton 3, Manchester United 0. Second Half ends, Everton 3, Manchester United 0. Substitution, Manchester United. Robin van Persie replaces Wayne Rooney. Substitution, Everton. Steven Naismith replaces Ross Barkley. Substitution, Everton. Arouna Koné replaces Romelu Lukaku. Corner, Everton. Conceded by David de Gea. Attempt saved. Kevin Mirallas (Everton) right footed shot from outside the box is saved in the top right corner. Assisted by James McCarthy with a headed pass. Offside, Manchester United. Daley Blind tries a through ball, but Falcao is caught offside. Attempt missed. Wayne Rooney (Manchester United) header from the centre of the box misses to the right. Assisted by Ángel Di María with a cross following a corner. Corner, Manchester United. Conceded by Gareth Barry. Attempt blocked. Ander Herrera (Manchester United) left footed shot from outside the box is blocked. Assisted by Luke Shaw. Corner, Manchester United. Conceded by Seamus Coleman. Goal! Everton 3, Manchester United 0. Kevin Mirallas (Everton) right footed shot from the centre of the box to the bottom left corner. Assisted by Ross Barkley with a through ball. Attempt blocked. Wayne Rooney (Manchester United) right footed shot from outside the box is blocked. Attempt blocked. Ander Herrera (Manchester United) right footed shot from outside the box is blocked. Assisted by Luke Shaw. Attempt saved. Falcao (Manchester United) header from the centre of the box is saved in the top right corner. Assisted by Ángel Di María. Attempt blocked. Ángel Di María (Manchester United) left footed shot from outside the box is blocked. Substitution, Everton. Kevin Mirallas replaces Leon Osman. Offside, Everton. Tim Howard tries a through ball, but Leighton Baines is caught offside. Corner, Everton. Conceded by Chris Smalling. Aaron Lennon (Everton) wins a free kick in the defensive half. Attempt saved. Ross Barkley (Everton) right footed shot from outside the box is saved in the bottom right corner. Assisted by Romelu Lukaku. Substitution, Manchester United. Ángel Di María replaces Juan Mata. Leon Osman (Everton) wins a free kick in the defensive half. Delay in match Ross Barkley (Everton) because of an injury. Attempt saved. Wayne Rooney (Manchester United) right footed shot from the left side of the six yard box is saved in the centre of the goal. Assisted by Chris Smalling. Corner, Manchester United. Conceded by Leighton Baines. Second Half begins Everton 2, Manchester United 0.